I was up town with my mum and the kids today, just for a wee wonder and something to do really. Anything to get out the house right? Anyway I found a gift card in my purse for Waterstones, so I went in to see how much was on it as can’t remember the last time I bought a physical book (been using kindle for too long…) Turns out I had £17.02 on it. 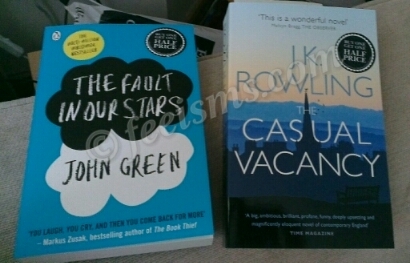 I know everyone and their granny is reading The fault in our stars at the moment and/or seen the movie which is just out, but I am late on the bandwagon as usual when it comes to overly popular books! Looking forward to reading it though. The girl in the shop has just read it and said it was good – she didnt cry but can see how others can/would. As for the J.K Rowling one, I’m intrigued to see how this one is after Harry Potter.. So, have you guys read either of these? Thoughts?… But no spoilers as I never, ever read the back of a book!